One of my most treasured gifts are my grandchildren. They make me smile and laugh. 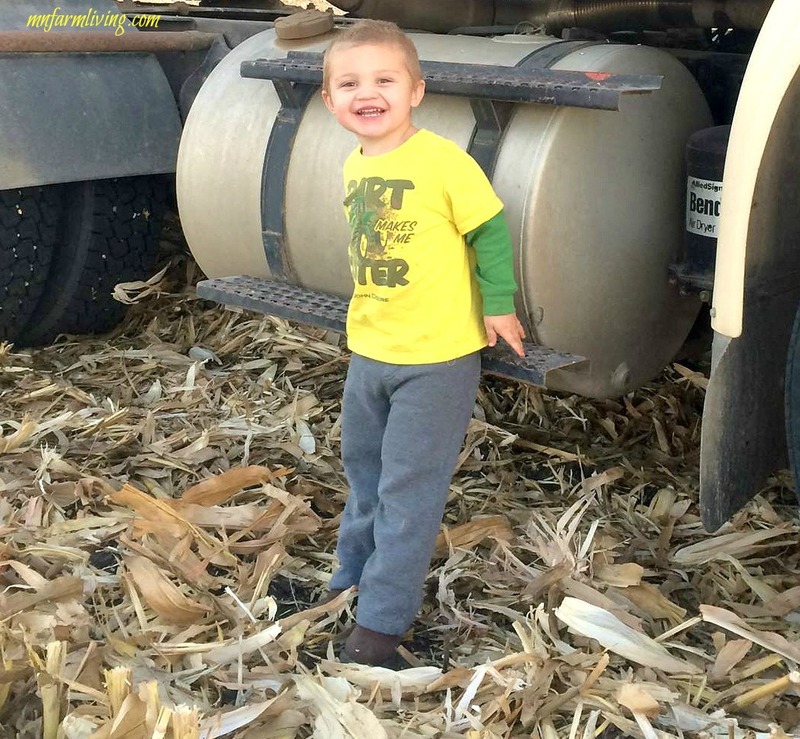 I have a story to share about a little boy (my grandson, Mr. E), a grain cart and some quarters and dimes. Before I start, let me tell you a little something about Mr. E. He is a very inquisitive, active 3-year old and has a smile that literally stretches from ear to ear. And he LOVES the farm! He loves everything about the farm–the pigs, the tractors, the trucks, the combine and anything else that moves in the field or out of the field. Mr. E was spending the day with his dad and they were having a conversation about him wanting a grain cart (again, all about farming). And for those of you who may not know, a grain cart is a cart pulled behind a tractor and is used during the fall to transport corn from the combine to the grain truck. These types of “farming” conversations are typical with Mr. E and they happen often. My son-in-law proceeded to tell him that grain carts cost of lot of money (let alone the fact they don’t need one because they don’t farm). End of conversation for the time being. My son-in-law sells roofs and had to drop off a sales bid to a potential customer. Mr. E stayed behind in the truck waiting for his dad. When my son-in-law returned to the truck he noticed a pile a change–quarters, dimes, nickels and pennies on his seat. Wondering what the money was for, he asked Mr. E about it. Mr. E told his dad it was for the grain cart and they needed to start saving for it. Oh, the innocence of a child. It’s times like this that I reflect on the blessings in my life. And with all the nastiness that is part of agriculture right now, I will just look back on times like this and just . . . smile. The nastiness? It’s really not part of the bigger picture of life, you know . . . The big picture is family. That’s what truly matters. And I don’t think I will look at quarters and dimes quite the same way again. Precious! Thank you for sharing. Fingers crossed that Mr. E gets his grain cart one day. I just talked to his dad and as much as he is willing to do for his son, a grain cart is not part of the picture right now. But maybe some day . . . Such a sweet story. Maybe a toy one is in his future?